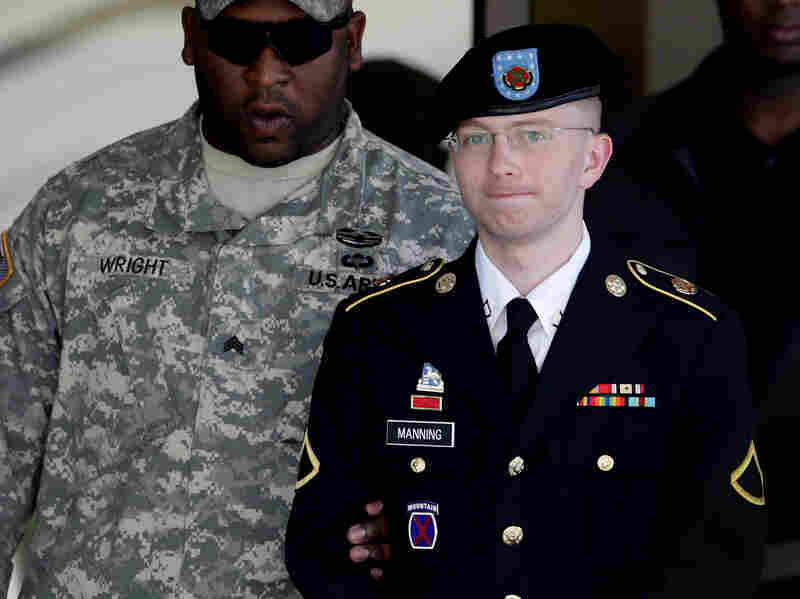 Bradley Manning Offers To Plead Guilty To Lesser Charges : The Two-Way It's the first indication that the Army private will acknowledge that he leaked classified information to the whistle-blowing website Wikieaks. The government could still try him on the 22 counts with which he is charged, including aiding the enemy. He faces life in prison. Bradley Manning, the Army private accused of leaking classified information to the whistle-blowing website WikiLeaks, offered to plead guilty to lesser charges, his lawyer said. In a statement posted on his website Wednesday, David Coombs, the defense attorney, said Manning offered to plead guilty through a process called "pleading by exceptions and substitutions." "To clarify, PFC Manning is not pleading guilty to the specifications as charged by the Government. Rather, PFC Manning is attempting to accept responsibility for offenses that are encapsulated within, or are a subset of, the charged offenses. The Court will consider whether this is a permissible plea." The statement also said Manning, who has been in custody since his arrest in Iraq in May 2010, chose to be tried not by a jury but by a military judge alone. Even if the court were to allow Manning, who is in pretrial confinement at Fort Leavenworth, Kan., to plead guilty by "exceptions and substitutions," the government can still try him on the original 22 counts with which he is charged. Those charges range from aiding the enemy to transmitting defense information, and fraud and related activity in connection with computers. The Associated Press reported Thursday that the judge in the case, Army Col. Denise Lind, will very likely consider Manning's plea at a Dec. 10 hearing. His trial is due to begin in February. "Manning would acknowledge he sent WikiLeaks hundreds of thousands of classified Iraq and Afghanistan war reports and State Department diplomatic cables, but wouldn't plead guilty to aiding the enemy or to violations of federal espionage and computer laws." Coombs' statement is the first indication that Manning, 24, will acknowledge that he leaked the documents to WikiLeaks. "If the judge accepts the unilateral plea and the trial on the other charges goes forward, prosecutors would apparently not need to present evidence of whether Private Manning provided the documents to WikiLeaks. That would mean such a trial would focus more directly on whether the leaking caused significant harm, and whether the charges, including aiding the enemy, fit the underlying facts." "Sometimes, Mr. Fidell added, a defendant might hope that such a move would help obtain a more lenient sentence by showing that he was cooperating and saving the government the time and expense of investigating, but in this case the offer has come well after the government already went to that time and expense." Coombs made the offer to the military court Wednesday. The hearing continued Thursday.